One of the things that makes some blogs so valuable is the technical expertise they can share with words, pictures, audio, and video. One example is Bruce Greenwald‘s Process Control Musings blog. Bruce is a VP of engineering services for the RE Mason Company, an Emerson local business partner in the Carolinas. The post that brought this to mind was Securing IE for Alarm Response Procedures. The potential roadblock they hit was a security risk. If you look at the IE [Internet Explorer] window that the PDF appears in, you’ll notice the menu bar is present. The risk is if someone were to click on the File menu, then click on Save As… – they could start dropping html files all over the DeltaV system. Just as critical is having the toolbar buttons or the address bar along the top. Click on Start, then Run… and type gpedit.msc – drill in to User Configuration -> Administrative Templates -> Windows Components -> Internet Explorer. Then look for a Setting named “Turn on menu bar by default”. Double click on it and change it to Disabled. That gets rid of the menu bar. 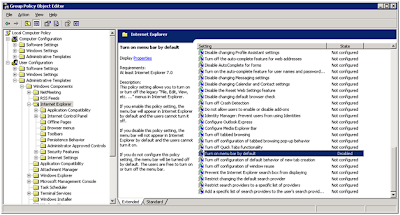 Bruce also described how to remove the Internet Explorer address bar through changes in the registry settings. At the end, he shows the finished secure look of an Internet Explorer PDF document with the browser address bar and menu bars from the displayed PDF file removed. Every day people at process manufacturers, process automation companies, integrators, and others share the answers to questions like these. The overwhelming majority of the time this knowledge is trapped in email inboxes and sent items folders. Thank you Bruce for sharing this with the world, especially with the next person trying to do something similar. Your post will undoubtedly be at or near the top of their search results. Anyone else willing to share his or her expertise? Posted Thursday, June 17th, 2010 under Operations Management, Operator Performance.